No houseplant truly prefers to live in the dark, but the bulletproof indoor plants listed below come pretty darn close. All you need to grow these gorgeous houseplants is natural light — enough to comfortably read without turning on the lights. Looking more like the back of a stegosaurus than an actual plant, the ZZ plant (Zamioculcas zamiifolia) will survive extinction-level neglect without missing a single beat. The leathery green “fronds” make it look like a cross between a cycad and a philodendron. And you can rest assured they’ll continue to look like that, even if you miss a month of watering or keep it in an absurdly low amount of natural light. Make new ZZ plants by dividing the root ball or by planting leaf cuttings. Understated yet elegant, the cast iron plant (Aspidistra elatior) has been popular since the Victorian age for its wide straps of deep, emerald-green foliage. Variegated types have patterns like cream bands and specks, but they may lose their markings if kept in low light for too long. Cast iron plants can survive considerable neglect, but keep the potting mix lightly moist for luxuriant foliage. You can call it snake plant, mother-in-law’s tongue or even Sansevieria, just as long as you don’t call it boring. Sansevieria trifasciata “Laurentii” is the variety normally encountered, but there are many other varieties with an assortment of foliage markings and shapes. S. cylindrica, for example, has cylindrical, sage-green leaves that are spread out flat like a fan. The worst thing you can do to a snake plant is give it too much water, so let the potting mix dry out between waterings. This is the most luxurious houseplant around, with fans of deep-green, glossy fronds on a compact clump of bamboo-like stems. They’re slow-growing and often expensive, but a lady palm can live an entire lifetime indoors with care and occasional repotting. To get the healthiest plant for your buck, keep the potting mix moist, and feed annually with a palm fertilizer. If the plant becomes root-bound, divide the root ball with a sharp knife, and pot up the divisions. Getting a peace lily (Spathiphyllum) to live in low light is easy. Getting one to bloom, on the other hand, is not. That’s OK, though, because its fountain of glossy, blue-green leaves is more than attractive enough in its own right — especially if you clean the leaves and periodically change the potting mix to prevent browned leaf tips. Thanks to its apathetic nature and tolerance to just about anything, that blotchy-looking, golden pothos vine (Epipremnum aureum “Aureum”) has become so common that it’s downright boring. Luckily, interesting cultivars abound, such as the chartreuse-green “Neon” and the appropriately named “Silver Satin,” with its velvety, sage-green leaves. Pothos isn’t picky, but if your plant gets a little leggy, prune it back and root the cuttings in new flowerpots. When it comes to palms, the Chamaedorea genus is chock-full of shade-tolerant species that can thrive indoors. Parlor palm (Chamaedorea elegans) is the most popular of them all for its bamboo-like fronds on narrow trunks, and the bamboo palm (Chamaedorea seifrizii) is practically the same thing, only larger. For a true conversation piece, however, grow metallic palm (Chamaedorea metallica). It has nearly iridescent, metallic, blue-green leaves, each bearing the shape of a mermaid’s tail. What could be cooler? Mistletoe is probably the very last thing you’d think of upon hearing the word “cactus.” Mistletoe cactus (Rhipsalis) grows in the shady rainforest, perched upon tree branches with other epiphytes, like orchids and bromeliads. Best of all, most members of the genus have long, leafless stems that drape down like wet spaghetti. One thing they do have in common with other cacti is their drought tolerance. Still, they do best with potting mix that isn’t allowed to dry out for long. The common heartleaf philodendron (Philodendron hederaceum) that we all know and love is only the tip of the iceberg. For an even more exotic look, grow self-heading varieties like “Moonlight,” with its crown of lime-green foliage, or the huge divided leaves of the split leaf philodendron (P. selloum). Better yet, grow the three of them together in a single pot. 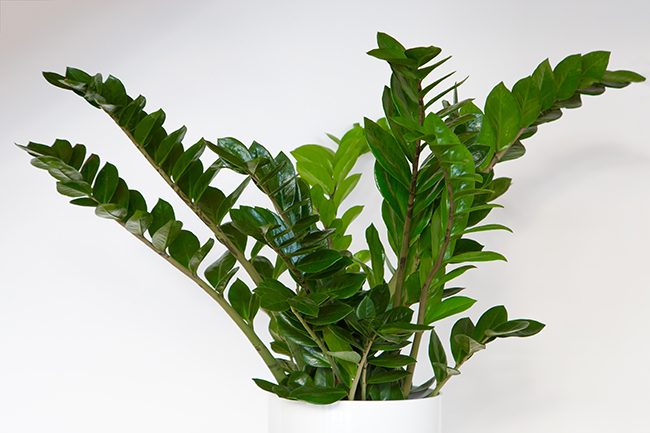 To keep your philodendron healthy, keep the potting mix moist, and remove any yellowed leaves. Periodically check between the leaves and stems for pests.